According to various reports from the British media, Manchester United manager, Ole Gunnar Solskjaer has decided on the candidate to replace the outgoing Paul Pogba as the club's captain. The Norwegian is reportedly planning to give Paul Pogba the responsibility for the upcoming season. After the retirement of Michael Carrick last season, Ecuador's Antonio Valencia was appointed as the club's captain for the ongoing season. However, the veteran's contract will be over this summer and the player has already announced that he would leave Manchester United at the end of the season. Hence, there have been a lot of discussions regarding who would replace Valencia as the captain for the upcoming season. Chris Smalling, David De Gea, Ander Herrera, and Paul Pogba have captained the club in the past and Solskjaer has now reportedly finalized on his candidate. Ole Gunnar Solskjaer has decided that it would be Paul Pogba who will be the captain of Manchester United for the next season. 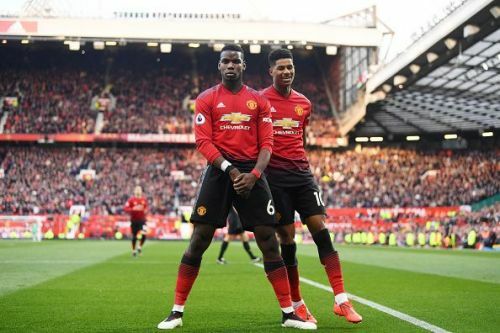 Although there are concerns regarding the Frenchman's future at the club, it seems the Manchester United manager has decided that handing Pogba the club captaincy would be the best way going forward. Not only would Pogba be committed to the club, but the additional responsibility could also bring out the best in Paul Pogba as a player. In fact, Paul Pogba was the captain of the club at the start of the season in the absence of Antonio Valencia for the first few games. After a scrappy win against West Ham United in the Premier League, Manchester United are still in the race for the Top-4. However, their immediate focus will be on the Champions League Quarterfinal return fixture against Barcelona on Tuesday night. It would indeed be a great achievement if the club qualifies to the next round.